There are a few of these at the co-op right now. Lemon cake, lemon custard and vanilla buttercream. Sooooo good. You could also get a Peanut Chocolate Chip Granola Bar, Oatmeal Cranberry Cookie or a Lemon Poppy Seed Muffin. Right now at the co-op you can pick up a Chocolate Chip Peanut Muffin. 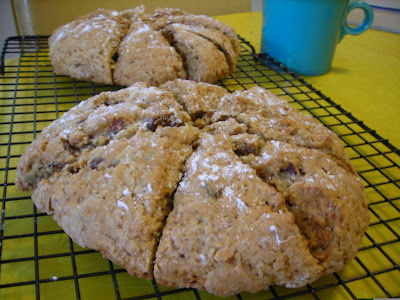 There are also Oatmeal Raisin Cookies, Light Lemon Cream Filled Cakes and Coconut Date Granola Bars. These Chocolate Cakes are Cream Filled and topped with Chocolate Ganache. Available at Slight Indulgence Collins Ferry Rd. location. Stop in for coffee and one of these cakes. Today at the co-op you can pick up a Lemon Poppy Seed Cookie, Apricot Almond Scone, Cranberry Pumpkin Seed Granola Bar(gluten free) or an Oatmeal Chocolate Chip Cookie. Tomorrow there will be Chocolate Cakes with Raspberry filling and Chocolate Ganache. These Ganache topped Cream Filled Cakes are at the co-op right now. Along with Cranberry Orange Muffins, Oatmeal Chocolate Chip cookies and Granola Bars. Pick up a cupcake at Bubble Sikaku along with just about any tea you can think of. They also have Walnut Streusel Muffins and some cookies to choose from. The Coconut Cakes are a special request made for Slight Indulgence. What you can't see in the photo is coconut custard. Underneath the buttercream is a hidden bit of coconut custard. Yes. Cream Filled Cakes topped with Toasted Coconut are at the co-op. They also have Granola Bars, Walnut Date Muffins and Chocolate Chip Cookies. There are a few of these cakes at the co-op. Lemon Ginger Cake with lemon custard and some vanilla buttercream on top. Also at the coop, Peanut Chocolate Chip Granola Bars, Peanut Butter Cookies and Cranberry Ginger Muffins. Chocolate Cupcakes topped with fluffy buttercream are available at Bubble@Sikaku. They also have a variety of cookies. Stop by for tea and a cupcake and say hello to Helen! As you see in the photo these cakes are a chocolate explosion. Great on their own but even better with a cup of coffee. These were made for Slight Indulgence if you would like to eat one. Zadie Cakes are at the Co-op. There are also Chocolate Chocolate Chip Cookies, Peanut Chocolate Chip Granola Bars and Orange Spice Currant Muffins.